Takeaway Lanzarote - Restaurants Puerto del Carmen Chicken Tikka Cooked with Spinach Served on Puree Bread. Indian Takeaway Lanzarote, Indian Restaurants takeaways , indian food delivery Puerto Carmen - Best Indian Restaurants Lanzarote with Delivery Takeout Canarias Las Palmas. Takeaway Lanzarote - Restaurants Puerto del Carmen Chopped King Prawns mixed with steamed potatoes then lightly fried. Indian Takeaway Lanzarote, Indian Restaurants takeaways , indian food delivery Puerto Carmen - Best Indian Restaurants Lanzarote with Delivery Takeout Canarias Las Palmas. Takeaway Lanzarote - Restaurants Puerto del Carmen Pastry Cases with Spicy Meat Filling .Indian Takeaway Lanzarote, Indian Restaurants takeaways , indian food delivery Puerto Carmen - Best Indian Restaurants Lanzarote with Delivery Takeout Canarias Las Palmas. Takeaway Lanzarote - Restaurants Puerto del Carmen Lightly Spiced Prawns served on a puree Bread. Indian Takeaway Lanzarote, Indian Restaurants takeaways , indian food delivery Puerto Carmen - Best Indian Restaurants Lanzarote with Delivery Takeout Canarias Las Palmas. Takeaway Lanzarote - Restaurants Puerto del Carmen Lamb Tikka & Chicken Tikka cooked on skewers in the Tandoor and served on a puree bread . Indian Takeaway Lanzarote, Indian Restaurants takeaways , indian food delivery Puerto Carmen - Best Indian Restaurants Lanzarote with Delivery Takeout Canarias Las Palmas. Takeaway Lanzarote - Restaurants Puerto del Carmen Spiced Mince Lamb cooked with fresh Potatoes and served on a wafer like thin bread. Indian Takeaway Lanzarote, Indian Restaurants takeaways , indian food delivery Puerto Carmen - Best Indian Restaurants Lanzarote with Delivery Takeout Canarias Las Palmas. Takeaway Lanzarote - Restaurants Puerto del Carmen Whole Green Pepper Spiced and cooked over charcoal , then stuffed with a choice of vegetables Lamb Chicken Tikka or Prawns, Served on a Bed of Salad. Indian Takeaway Lanzarote, Indian Restaurants takeaways , indian food delivery Puerto Carmen - Best Indian Restaurants Lanzarote with Delivery Takeout Canarias Las Palmas. Takeaway Lanzarote - Restaurants Puerto del Carmen Marinated , rolled in breadcrumbs and then deep fried , served with salad. Indian Takeaway Lanzarote, Indian Restaurants takeaways , indian food delivery Puerto Carmen - Best Indian Restaurants Lanzarote with Delivery Takeout Canarias Las Palmas. Takeaway Lanzarote - Restaurants Puerto del Carmen Fine chopped pieces of chicken cooked in fresh garlic and other spices. 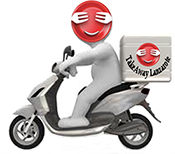 Indian Takeaway Lanzarote, Indian Restaurants takeaways , indian food delivery Puerto Carmen - Best Indian Restaurants Lanzarote with Delivery Takeout Canarias Las Palmas.